Stop rust in its tracks! Superior UV Resistance and Convenient Spray Aerosol or Brushable Quarts & Gallons. Stop rust in its tracks! Rust Encapsulator is the easiest way to stop and prevent rust and corrosion from spreading. Eastwood Rust Encapsulator has been tested by an independent lab to be one of the most effective rust-preventive products yet. Rust Encapsulator is a great primer for floor pans and other underbody parts. It fills tiny pin-holes and surface irregularities, and is compatible with lacquer, enamel and urethane topcoats (including Eastwood Chassis Black). 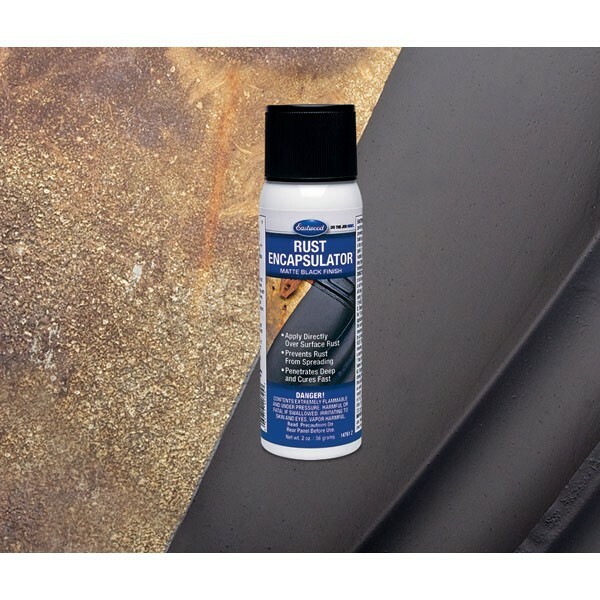 For the absolute ultimate rust remedy, first brush or spray-on Eastwood Rust Converter, then prime with Rust Encapsulator. One 15-oz. aerosol covers about 10 sq. ft., and contains no isocyanates. Heat-resistant up to 400℉. Use a wire brush to remove loose rust, scale and paint, and remove dust, grease and oil deposits. Wipe down with either Acetone or Pre Painting Prep (10041Z). Feather surrounding paint with 220-grit sandpaper. Shake can for at least 2 minutes once the mixing ball starts to rattle. Hold the Rust Encapsulator can 10-12" above surface as you spray. A single coat dries to the touch in 20 minutes, and is thoroughly dry in 3-4 hours at 68℉. For greater durability, a second coat can be applied 1 hour after the first. Allow 6-8 hours after the last coat before applying topcoat. Use over or under body fillers. Work in a well-ventilated area when applying this product. The use of a respirator is recommended. Shake aerosol vigorously for 2 minutes before spraying. In this video, Eastwood shows you the numerous types of Rust Encapsulator products and colors. Not only is this poplar coating available in black, but also in red, yellow, white, silver, gray and even clear. Plus there is a Textured formula and a Rubberized Rust Encapsulator that combines the features of both Encapsulator and Undercoating. It's great not only for that restoration, but also the daily driver, heavy equipment, mowers, tractors, salt spreaders and snow plows. I have applied a lot of the black matte encapsulator finish on an old truck frame without much if any surface prep & some white rust encapsulator on old shocks. I would say the paint is great & the applicator (me) needs replacement. Even at that I think it stopped the rust and now six months later I see no bleed through & I have been watching it on the white shocks. These shocks were ugly rusty and pitted & now they are bright white and look great at 10'. Sure makes for an easy improvement on rusted truck frames. I used Eastwood's wheel paint with more prep and it looks great. We'll see in time and with winter salt comingg. Great Product for intended purpose. I've purchase this product for a couple different projects a couple years back and 2000 Jeep for my son this year. I live in SC and its humid.. So much so that you can see the moisture build on the area that was sprayed with another product "NOT Eastwood brand" rust converter and prep (jeep is in the garage and out of the elements) 1 month from day of application. The Eastwood Encapsulator has shown no signs of rust or moisture build up as this sets in the garage for over a month. For anyone using the Eastwood Encapsulator I would stress that you follow up with Eastwood's Extreme Chassis black, it builds a tough barrier on those spots that you treated that get exposed to road debris. I've heard of other people using this product without top coating it and their results were unfavorable I believe due to location of area treated and application method. Prep, clean, apply and top coat. You will be glad you did! My local body shop wanted nearly $1000 to replace my front bumper. Instead, I ordered the black rust encapsulator and planned to cover it with a bra. After some minimal sanding, I applied two coats and it looks fantastic! I have the bra, but I don't even need it. It matches my front grill, so you don't even notice it's not painted metallic grey as it was. I would not hesitate to use this on anything that rusts. I told all my friends I would want to be a distributor I believe in this stuff so much. I also told them I would help with their projects as it was easy and enjoyable to work with. It covered and and sealed like a dream. I will be buying again soon. I have been using the black rust ecapsulator for over 6 years - both from the can and the spray can now on a variety of projects from my 66 Mustang to my 66 F250 and now a 66 VW Beetle. Goes on great, dries relatively fast and is very durable. I've used it several times without a topcoat and it holds up great. Given that I live in Arizona I can't say I have tested this stuff to the limit in terms of rust prevention, but it is very handy when you just can't get off that last little bit of rust. Gives me peace of mind. I even use it on bare metal that is not rusted. It's a bit pricey and sometimes the nozzle clogs or the accelerant runs out before the can is empty, but overall I have been very pleased with the product. I'm working on a 68 Mustang Fastback, with the dreaded Cowl repair, I replaced the drivers and passengers side cowl, I decided to use Rust Encapsulator on the whole bottom cowl and it looks great, I also used it on the ne floorpans and it will cover the Eastwood seam sealer. I will probably be using more on the bottom side of the floor pans on the surface rust of the welds. One of the best features is that it dries in about 20 minutes and you can paint over it. PS wear clothes you don't care about and disposible gloves, because it will not come out. If you get it on your skin a small shot of brake cleaner will get it off, hand cleaner will not. Thanks for a great product. I bought this to touch up my engine compartment on my 72 Mustang convertible. I brushed off the rusty areas with a wire brush, scuffed up everything, wiped it all down with acetone and applied. I used two or three wet coates to get great coverage and I'm sure there won't be any rust coming back any time soon. Eastwood products really perform to their claims. I was planning on spraying a semi-gloss black over this to match the stock gloss levels, because the matt really isn't concours for a Ford, but it looks so good that I decided to paint the rest of the engine compartment with this product. It looks that good. I just bought a used SUV that had been subjected to some harsh winters with some light rust spots in places on its independent suspension elements. I brushed off the loose rust and sprayed on the flat black encapsulator. It adheres well, dries quickly, and looks good. Drying time is minimal, especially in my low humidity environment. I can recommend the flat silver encapsulant too, which I also used in places. Eastwood's Rubberized Undercoating, which I have used in places, is a great product also. Based on my experience, I prefer the encapsulant treatment to a "rust convertor" that I tried from another company. I use this as a base for my frame painting on my show truck and am really pleased with it - so much so I plan to do my tow rig next then probably my daily driver. Follow the prep guidlines well (as you should with any paint product) and you'll be pleased with the results too. I've actually started to shoot it with the airless sprayer that I got off here, and I think that actually gives a superior coating to brushing it on. Plus it dries quickly regardless of the application method, so you can move on to final finishes sooner. Definitely worth the money. Let me just say this stuff is beyond belief. Don't even consider buying spray paint at your local store. This stuff is less expensive and works 300 percent better. I'm Amazed. Going to save me a ton of money and time on my restore. I am 53 years old and grew up in the automotive repair business, my father was a body man from before I was born so I have seen a lot of "The latest Thing" products come and go. 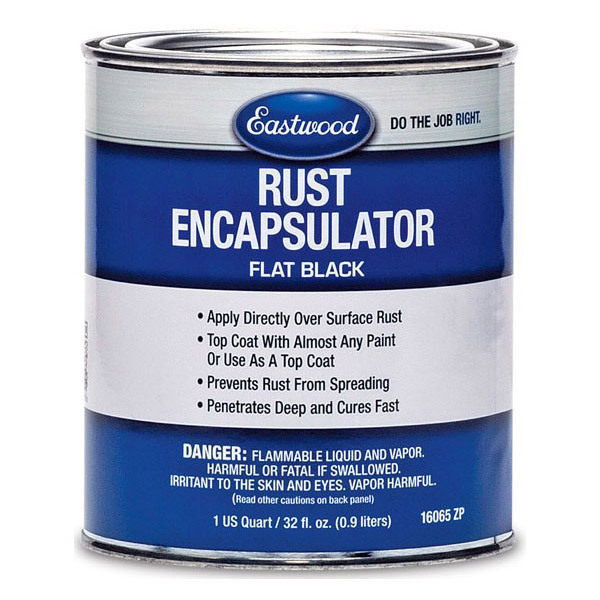 Eastwood Rust Encapsulator is the best rust product I have ever used bar none! I am currently restoring a 1971 Pontiac Lemans that is showing rust in the usual places, however beneath what you can see is the real culprit, it is rusted under the rear trunk panel to the point is was thin and weak, after prep and spraying with Rust Encapsulator, the strength of this rusted panel is incredible. One word of warning, wear clothing over every inch of skin as this stuff sticks to everything and sticks well. In a word? the ultimate Rust product! 5 stars straight across the board.